If you have not read already, I am a Mimi again. 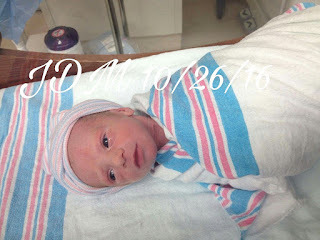 My little sweet pea was born on October 26, weighing in at 3 lbs 14 oz, and 17.5 in long. She is so precious and this card I have made is for her. Not the first I have made for her in the past 3 days and most certainly there will be many more to come over the years. Now for my card. 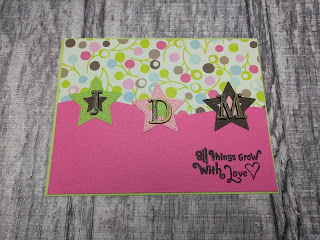 Using some patterned paper from my stash, I believe is from The Paper Studio, and some Doodlebug plain from a 6x6 pad, I was able to make the card topper. The dies for the stars are from Die Cuts and More, and the card topper was cut with dies from Katscrappiness. The wavy edge die is from Lawn Fawn. The sentiment is from a Hampton Arts set called Dreams. The charms are from a collection I was gifted last year. I hope you have enjoyed my card, I will be back in a couple days with a new post. However until then... get crafting. Gorgeous new baby and a sweet welcome to the world card. Thanks for using the sketch from CC&S. Thank you Jane, this was a fun one to work on. Congratulations! Wonderful card. Thanks for playing along with us at CC&S! The die cut stars make a great background for those pretty metal letters. Thanks for sharing your card and your sweet little granddaughter with us at CC&S!